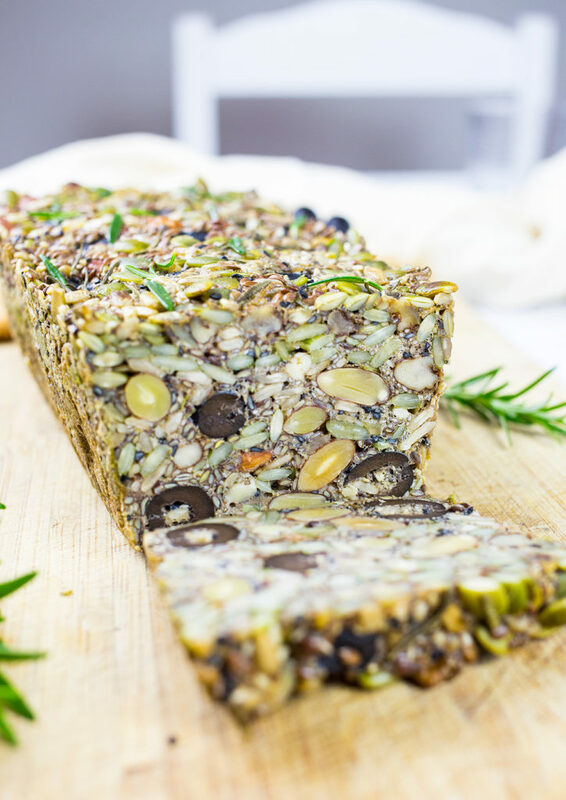 These easy to make carob and tahini seeds bars make the perfect nutritious and tasty lunchbox snack! 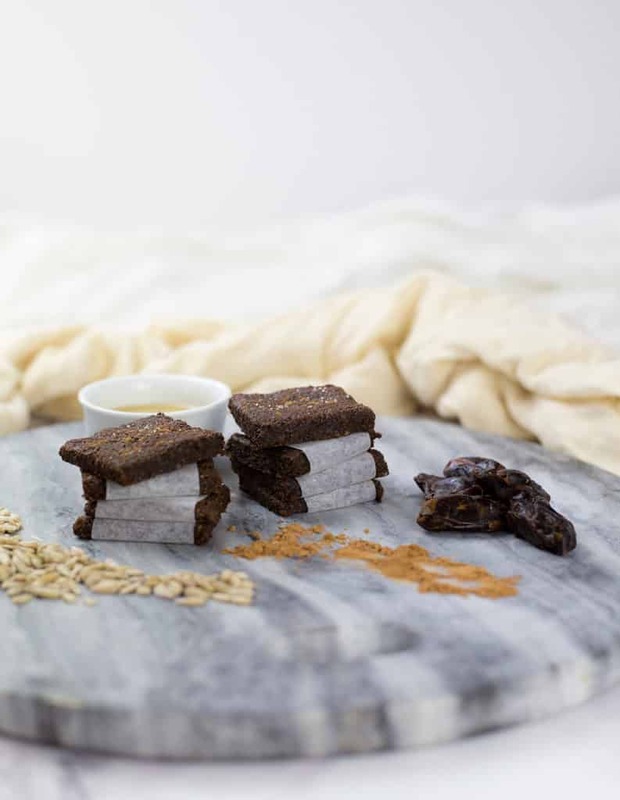 Gluten free, nut free, no added sugar or dairy, these seed bars make a healthy allergy friendly snack. I love easy to make nutritious snacks. 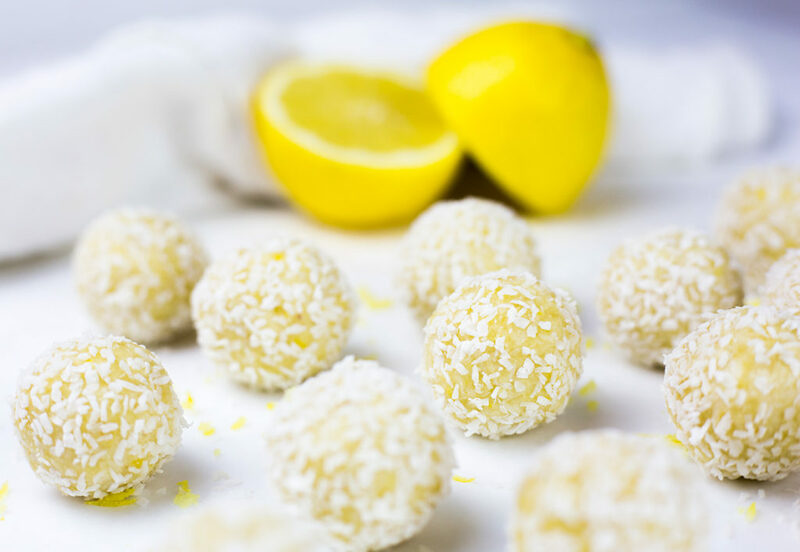 Homemade snacks are always a winner in my mind as you know exactly what is in them! 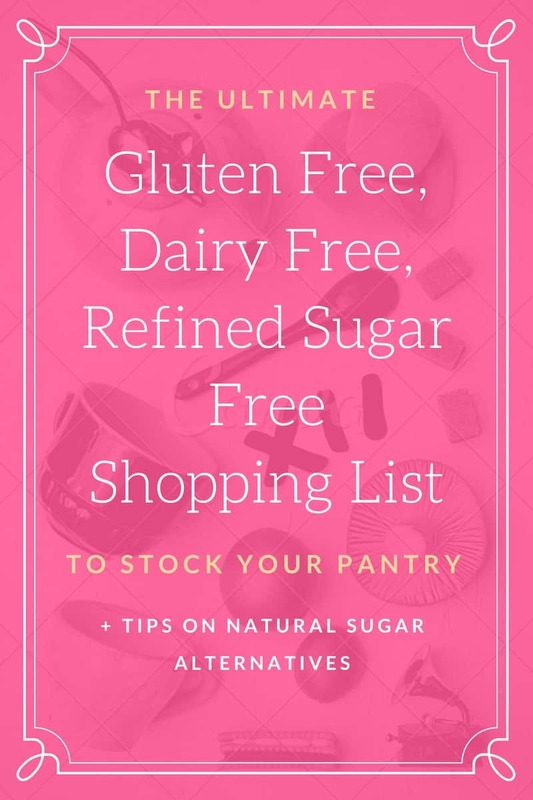 No need to worry about hidden additives, poor quality oils and refined sugars. 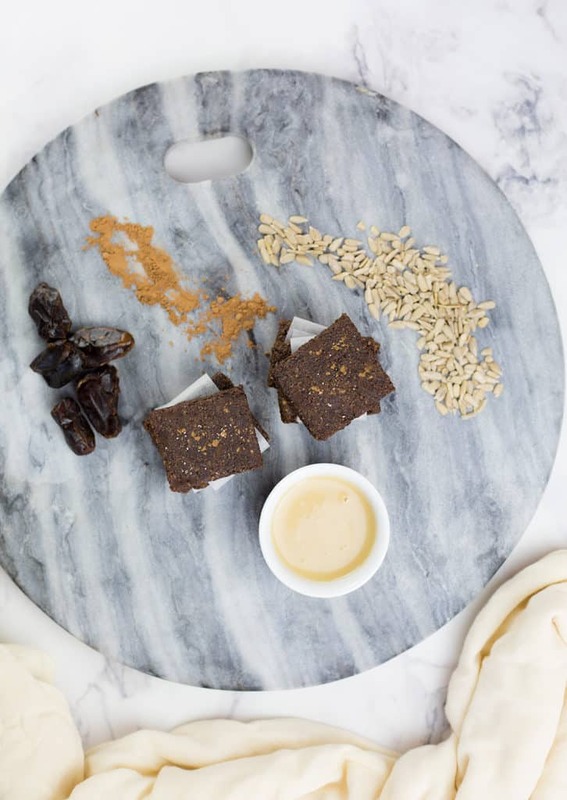 These healthy carob and tahini seed bars are full of protein, healthy fats and fibre. They can help provide kids with sustainable energy without the stimulating effects of cacao or chocolate. 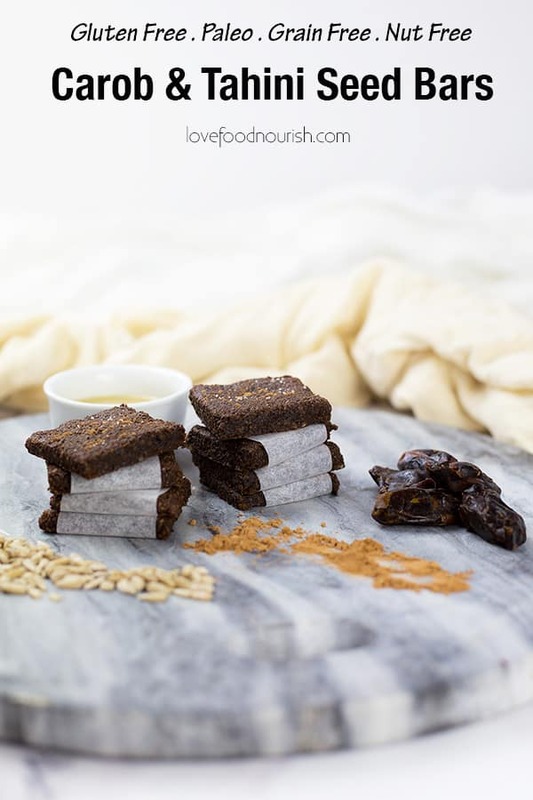 These bars are naturally sweetened with dates which also gives them a fudgy consistency and some extra added nutrients and fibre. Have you ever tried carob? It has a subtle flavour that isn’t as strong as cacao or chocolate but I actually quite like it, carob has a mild malty flavour and a natural sweetness. It isn’t bitter at all so it is perfect for kids and doesn’t need additional sugar to balance out the flavour. When I was younger I loved carob buttons or carob bars, there was something about them that was so creamy, sweet and satisfying, I would sometimes choose carob over chocolate! Carob doesn’t contain caffeine so this makes it a great alternative to raw cacao, chocolate or cocoa powder to add in to baking or smoothies for kids or if you are just sensitive to caffeine. You will get the sweet hit but without the stimulating effects that can you can get from cacao. The tahini I have added in these bars adds to the texture and slightly to the flavour of them although it is very subtle. 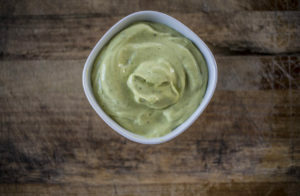 Tahini is a good dairy free form of calcium so if you have a dairy intolerance adding tahini into your diet can be an easy way to bump up your calcium levels. Add dates to your food processor and blitz until you have a lumpy paste. Add the sunflower seeds and blitz until they are roughly chopped into tiny pieces. In a small bowl lightly whisk an egg with a fork and add to the food processor. Add the rest of the ingredients and blitz until you have a sticky dough. Roll the dough out between two layers of parchment/baking paper. Roll until the mixture is around 4mm thick. Remove the top piece of parchment paper. With a sharp knife cut off the ends so you have a neat looking rectangle. Then score the dough into rectangles/bars. Sprinkle with carob powder or sea salt if desired. Cook for 15 minutes. Leave to cool before breaking into bars. 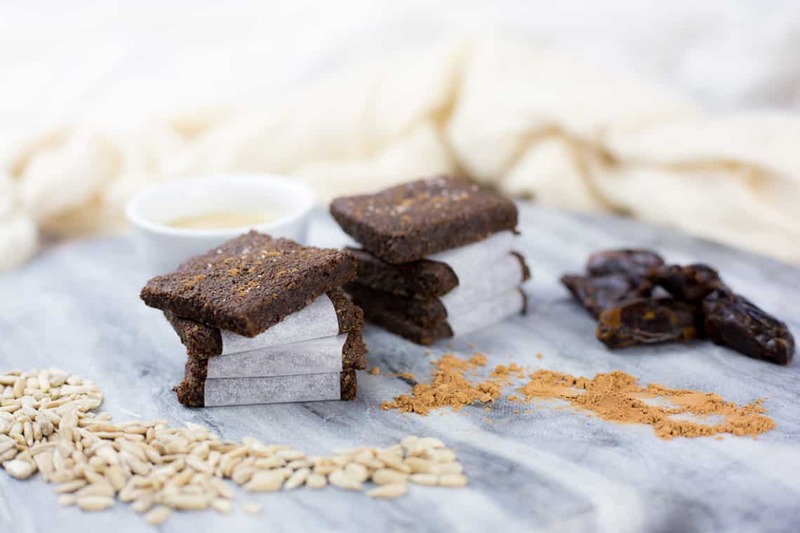 February 13, 2019 at 9:06 am I love carob... and tahini! What a genius combo! February 13, 2019 at 9:41 am Thanks Raia! 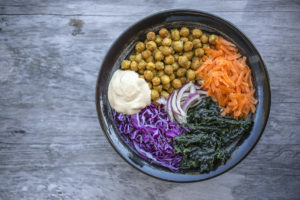 February 13, 2019 at 10:11 am I'm always looking for more ways to use Tahini and your recipe sounds and looks amazing! 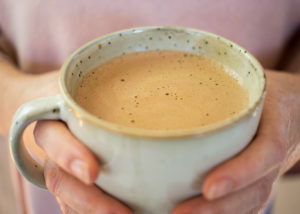 February 13, 2019 at 11:08 am I love carob...not b/c it's like chocolate, but because it is good in its own right!! These look rocking! 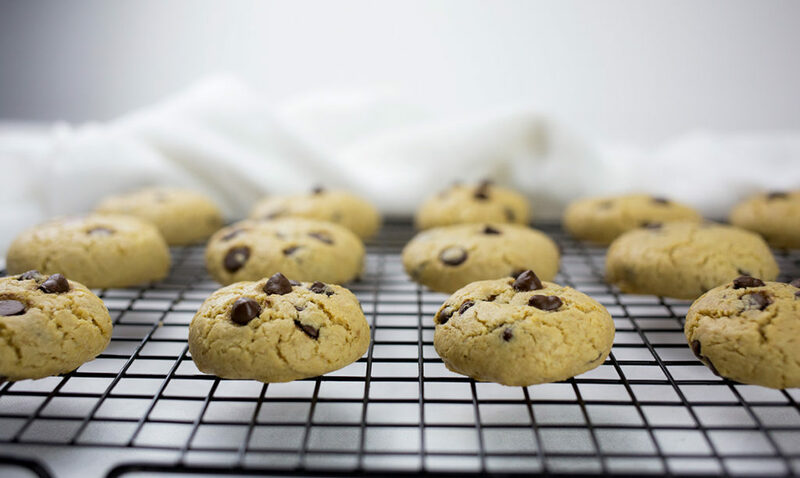 February 13, 2019 at 2:45 pm I love the carob flavor in these! Paired with the sticky, sweet dates and seeds, it's such a fun and delicious snack. February 14, 2019 at 6:07 am Ooh, these look so snackable. Might have to try it with cacao as that's what I have on hand. 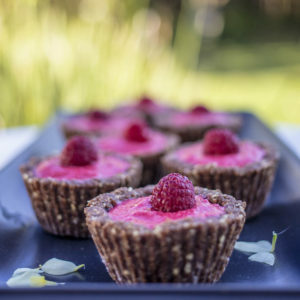 February 15, 2019 at 4:59 pm Delicious and healthy chocolate treats! I love it! February 21, 2019 at 12:32 pm Thanks ChihYu! 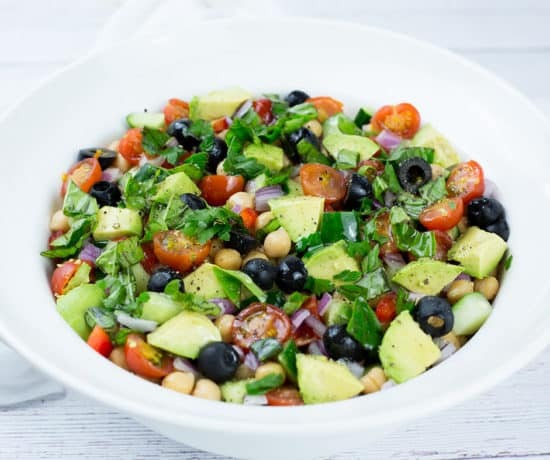 February 17, 2019 at 9:21 am I really like carob too, and yes to tahini. These look great! February 21, 2019 at 12:32 pm Exactly! Thanks Zuzana! 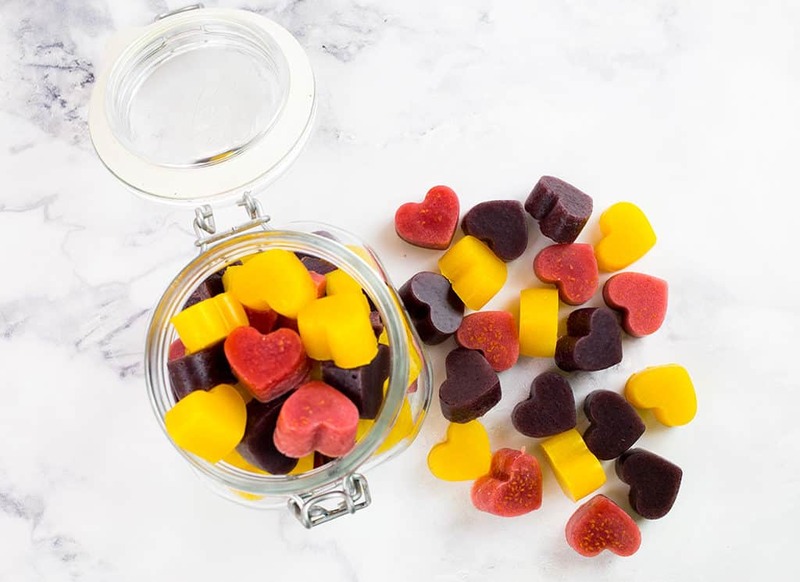 February 18, 2019 at 11:54 am These are just perfect for a healthy snack. 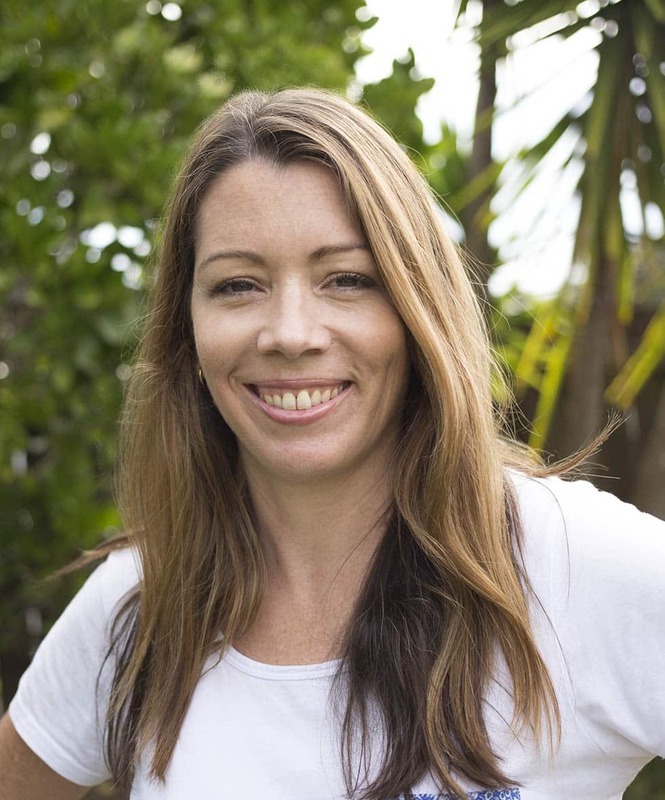 February 21, 2019 at 12:31 pm Thank you Anne! February 18, 2019 at 4:47 pm yum! tahini is always an ingredient I love but don't use very often! I'll have to try this out for my kids lunches!